I like the second version better from the standpoint of how easy the design is to take in, but also because if I’m using something like CGPath (I usually code using Cocoa/Appkit stuff), or similar types of path libraries, there’s typically a method for drawing dashed lines built in. Even if not, it could be achieved with drawing three lines same as background color on top, which is still kinda more “minimal”. I know I’m being captain obvious here. As far as design goes, I subscribe to that “clean page is a perfect design” philosophy. The more minimal one seems a little more universal and like there’s less to object to. 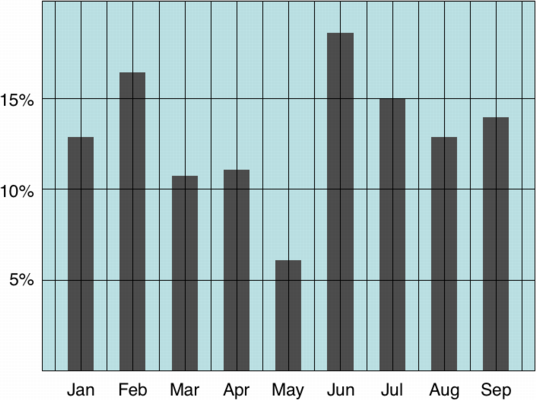 The grid seems to overemphasize the separation between months, when it’s already “there” because of the bars and month labels.